Some parasitic hair worm can actually brain-wash grasshopppers by introducing a protein which will drive it to water, where the grasshopper drowns and the worms reproduce. That's crazy! Did you know you emit light!? I wonder if it works by going into a pitch dark room, and sticking out your palm! 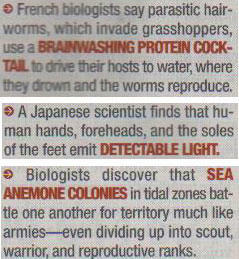 The sea anemone wars must be funny to watch! I imagine something like lord of the rings in slow-mo!!! I wonder what the "scout" anemones look like when they're on the hunt! Yesterday, I met my new student. I am tutoring her for AP Calculus. She goes to OPRF high school in Oak Park. We were originally gonna go to the library, but they were closing too early, so we sat down in the smallest Caribou in the world! It only had three small tables. The whole place was practically taken up by the bar and cash register thing.